An evergreen foliage plant, Fatsia japonica can be grown as an indoor plant, or outdoors in temperate climates. Good glossy green foliage, and very easy to prune. Fatsia japonica is commonly called the Japanese Aralia, it can be grown in the garden or as an indoor plant. The foliage varies in colour from a light green to a deeper green, it tends to darken as it ages and is darker when grown outdoors. Grown as a foliage plant for the large glossy deeply lobbed or palmate leaves this is a shade loving plant. If you are growing it indoors, choose a good quality potting mix and grow Fastsia japonica in good filtered light. Outdoors, choose a sheltered position protected from direct sun. It makes a great evergreen textural plant for shaded positions, beneath taller trees or between buildings. If you need to prune Fatsia japonica you are best to hard prune it, or at least remove a whole branch to the ground. When left to grow as a tree it will die back at times and these stems can be cut right back. If you want to grow this as a house plant, prune back individual stems to around 1 metre (3 ft) always try to prune just above foliage or a growth node. Propagation is easy, usually from cuttings, also possible from seed. Soil – Humus rich and moist with good drainage. Foliage – Glossy green, lighter new foliage ageing to a deeper green. Flowers – Small white flowers followed by black berries. Toxicity – All parts of the plant are poisonous. 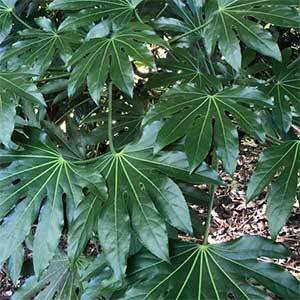 Container growing – Yes, Fatsia, japonica is suited to growing in pots. Fatsia Japonica is available for sale from the following participating nurseries. We offer a wide range of quality plants (seedlings to advanced trees) delivered straight to your door. No minimum required and quality assured. We deliver Victoria wide and can plant for you too.